~10 spp. of trees and shrubs from Mexico and Central America. 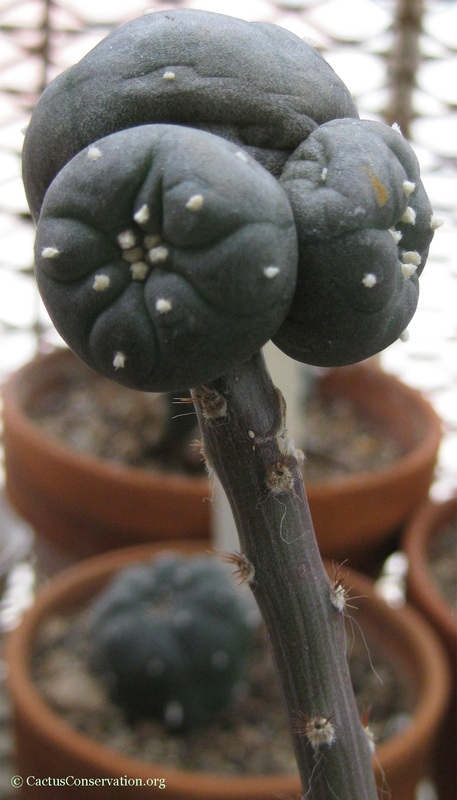 They are cacti but have thick leaves which are broad and flat. Umbilicate fruit has a few bony seeds, covered with matted hairs. Allied to Opuntias but more similar in habit and foliage to Pereskia. Sometimes this is spelled Peireskiopsis. Many authors use this spelling in spite of its potential conflict with the Code of Nomenclature. Some have claimed that the Code has been specifically amended to allow this. Most species apparently lack analysis. Many growers use Pereskiopsis as grafting stock to graft young seedlings or small cuttings until they get large enough to be regrafted onto a larger sized stock or their own roots. They are also used to decrease the time required for seed production due to their ability to accelerate the growth rate of their scions. 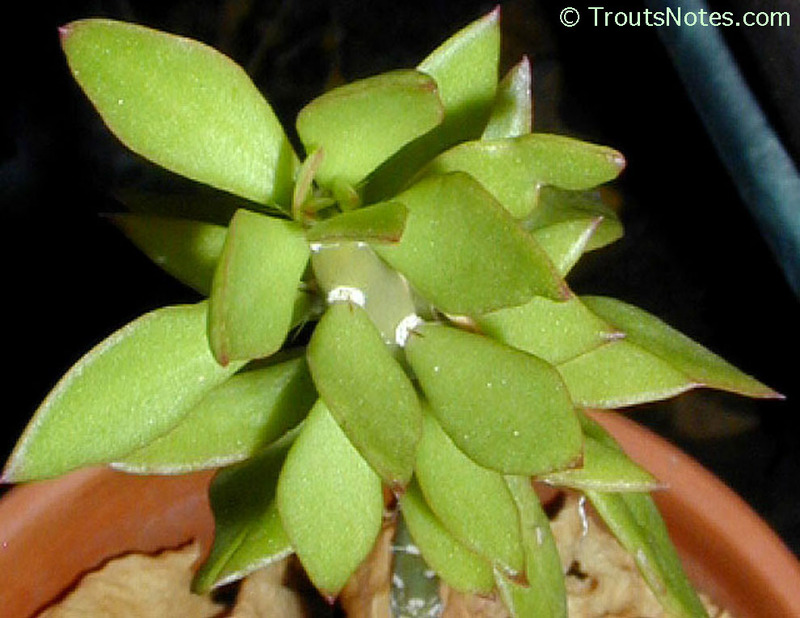 The tiny glochids do require a little care in handling but they are valuable tools for plant propagation & cactus conservation. My thanks to Cactus Conservation for letting me use these two images! 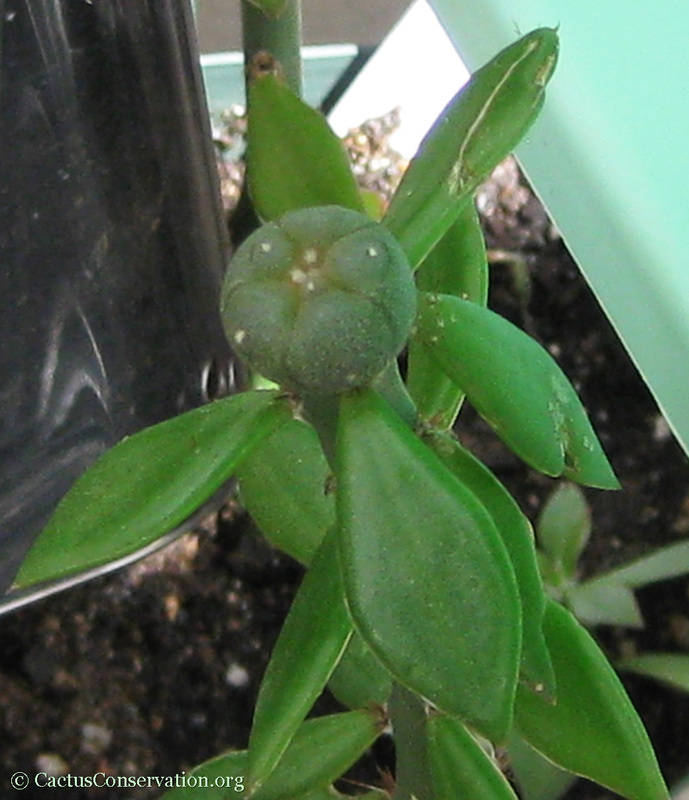 Now considered a synonym of Pereskiopsis kellermanii Rose (1908) Smithsonian Miscellaneous Collections, 50 (4): 332. Grusonia kellermanii ( Rose ) G.D.Rowley Tephrocactus Study Group, 12(3): 42. 2006. Etymology: scandens is in reference to its apparent “climbing” habit due to sprawling across shrubbery (“scandent”). kellermanii was named for botanist William Ashbrook Kellerman who collected the species. Distribution & occurrence: Occurs in Yucatan, Izamal and Merida in Mexico. Kellerman collected P. kellermannii in Guatamala. “Stems glabrous, herbaceous, weak and clambering over shrubs,about 2 cm. in diameter ; second year’s branches with cherry-colored bark; old stem spineless (?) ; young branches spineless or with a single short spine ; glochids numerous, brownish ; leaves glabrous, orbicular to ovate, 3 cm. long by 2 to 2.5 cm. broad, acute; flowers not seen ; fruit red, glabrous, leafy, 6 cm. long ; seeds covered with matted hairs. Collected by W. A. Kellerman at Trapichite, Guatemala, January 1, 1907 (no. 6025). p. 332 in Britton & Rose 1908. Clambering shrub to 10 meter tall. Stems are grey in color, round in cross section and smooth. Leaves are smooth, tapering and ovate; up to 2 cm in length. 1 short (5 mm) spine is borne from the woolly white areoles. Yellow flowers form slender, more or less tubercled, fruit which mature slowly and contain few seeds. 3,4-Dimethoxy-β-phenethylamine observed at 0.0029% in the dry plant. Using tlc, Tyramine was found to be also present. Despite the low value it might be suggested that this and additional species be looked at more closely with an eye to alkaloid concentrations in the plant’s various tissues and possible seasonal fluctuations.